From the movie The Dead Lands, directed by Toa Fraser and released in 2014 . San Francisco, CA (September 4, 2015) –The 40th Anniversary American Indian Film Festival returns to the San Francisco Bay Area Friday, November 6 to Friday, November 13. Showcasing the best Native cinema the festival will present films at the AMC Metreon (135 4th St., San Francisco). The annual American Indian Motion Picture Awards Show & Gala will be held on Saturday, November 14 at the Hotel Nikko. The awards show recognizes outstanding Indian cinematic accomplishments. For complete details, visit aifsf.com. WE’RE STILL HERE: JOHNNY CASH’S BITTER TEARS REVISITED is a feature documentary based on director Antonino D’ Ambrosio’s critically acclaimed book A Heartbeat and a Guitar: Johnny Cash and the Making of Bitter Tears, which tells the story behind Cash’s largely unknown protest concept album (1964) and his collaboration with folk artist Peter Lafarge. With this recording, Cash placed himself in the middle of fervent social upheavals gripping the United States at the time by using his album to speak out on behalf of Native people. Coming at a time when America is once again gripped by racial tension and social unrest, this flm, and the story it tells, serves as a metaphor for a country caught between decline and progression. Set on the Great Plains and the Badlands of Pine Ridge Indian Reservation, SONGS MY BROTHER TAUGHT ME is a compelling and complex tale that explores the bond between brother and his younger sister, who fnd themselves on separate paths to rediscovering the meaning of home. MEKKO paints the portrait of a homeless Native American parolee in Tulsa. As he struggles to fnd his way in the outside world after two decades behind bars, the titular Mekko (Rod Rondeaux) discovers a chaotic yet occasionally profound and beautiful community of impoverished Natives, which now includes Bunnie, one of his old carousing buddies from his wilder youth. Though Mekko fnds some peace in this society that exists on the fringes of our modern world, he also uncovers a darkness that threatens to destroy it from within. After a tragic series of events, Mekko dedicates himself to a quest for revenge which he believes will cleanse the sickness from this collective of marginalized individuals and perhaps atone for the sins that landed him in jail so many years ago. LE DEP is a psychological drama about Lydia, (Eve Ringuette) a young Innu woman, who routinely works at her father’s convenience store in a small First-Nations community in Québec. One night, as she prepares to close up, she is held-up at gunpoint. This traumatic experience becomes even more perplex as she recognizes her assailant. Inadvertently, Lydia will be forced to make a decision that will forever change her life. 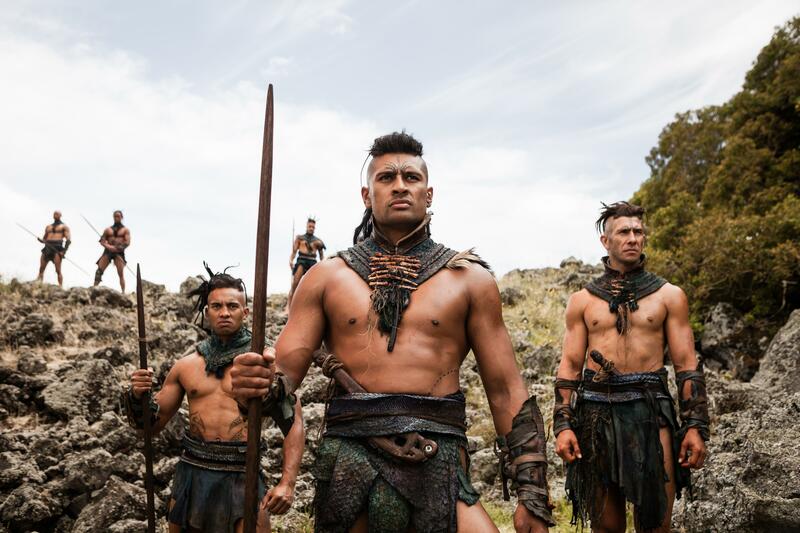 In THE DEAD LANDS, Hongi (James Rolleston) – a Māori chieftain’s teenage son – must avenge his father’s murder in order to bring peace and honour to the souls of his loved ones after his tribe is slaughtered through an act of treachery. Vastly outnumbered by a band of villains, led by Wīrepa (Te Kohe Tūhaka), Hongi’s only hope is to pass through the feared and forbidden Dead Lands and forge an uneasy alliance with the mysterious “Warrior” (Lawrence Makoare), a ruthless fghter who has ruled the area for years. Special Invitational Presentation. All matinee and evening screenings will be held at the AMC Metreon (135 4th St., San Francisco) and will begin at 12 noon and 7 p.m. For ticket information please visit aifsf.com. The American Indian Film Institute’s mission is to foster understanding of the culture, traditions and issues of contemporary American Indian and First Nations peoples. We encourage Indian flmmakers to bring to the broader media culture the indigenous voices, viewpoints and stories that have historically been excluded from mainstream media. Moreover, our goals include tireless advocacy for authentic visual and work-force representations of Indians in the media. The American Indian Film Festival, established in 1975, is the oldest and most prominent media showcase of its kind in the world. In four decades of work, AIFF has screened nearly 3,000 films from American Indian and First Nation communities. Posted on October 25, 2015, in Uncategorized and tagged American Indian Film Festival, American Indian Film Institute, Indigenous filmmakers. Bookmark the permalink. 2 Comments.